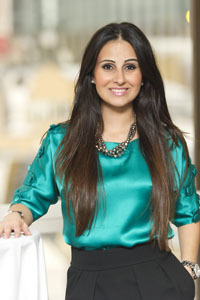 Melody Hossaini, the former BBC1 The Apprentice candidate was the guest speaker at an IFS event. 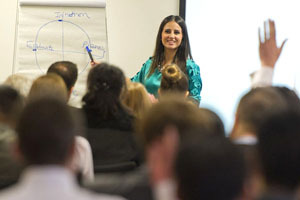 She is now running her social enterprise InspirEngage International. I took the first picture using the natural light coming in from the 30th floor window with just a flash bounced off the white ceiling to fill in the shadows. Melody told me about her last experience of being photographed as a speaker at an event and was dismayed the photographer just came up with close-ups of her in action – they didn’t give a sense of place or the energy of the interaction between herself and the audience. This will happen if the photographer just sits at the front and points the camera forward – it is easy not to capture the real essence of an event. In most cases it means moving around and predicting what will happen to capture the shot. In this second shot I moved to the back of the room and waited until Melody had got the audience reacting to her and I feel it communicates better how she is able to motivate a crowd.